I can't believe it's fall already! These past few nights it's gotten darn cold, I've even turned on Oliver's heating pad! My plate has been running pretty full these past few weeks with work stuff, house stuff and cat stuff so that hasn't left me much time for visiting blogs or for loving on my neglected kitties. :( Hopefully, that will change after this weekend and I can resume my normal rhythm of life. Late last night I posted up my long write up on my recent TNR project from last weekend. There are still a few loose ends to wrap up on the project (like trapping one holdout!) but the bulk of the work is done. You can read all about the adventure over at BackyardTNR.com. It was a lot of work but it was a great experience! I can't wait for the next one!! adopted by another property owner and will remain an inside/outside cat so he can hang out with his sister and mother when not cuddling with his new servant. One mom-cat remains to be trapped and altered. Laura and I are hosting a big party for everyone in the Community Cat Coalition. Oliver graciously offered the use of his yard for us all. I realize it's late notice, but you all are invited too! There will be at least a dozen people from all around the Puget Sound area converging in Oliver's yard for some good food, fellowship and a few cat stories! There will be a kitten exchange too! Several people who foster feral kittens like to swap their kittens every so often so the kittens get socialized with lots of people. Hopefully all the cats go home with people and don't stay here! As I was working on my project write up post late last night, I kept an eye on the porch cam and feeder cam. I happen to notice a different kitty having a late night snack on the back porch! 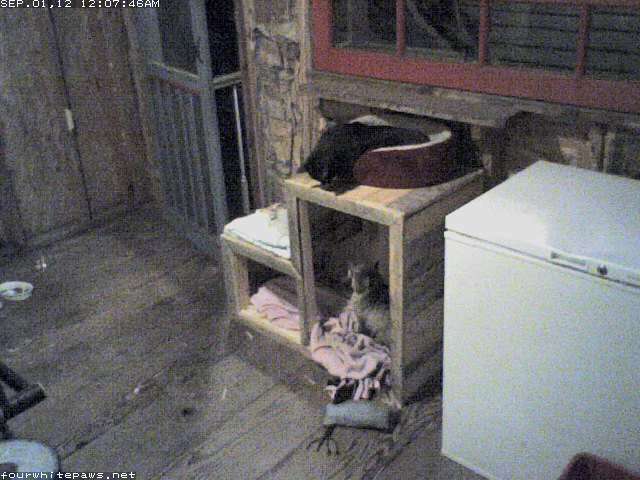 Whoever this kitty was, Oliver didn't seem to mind, because he just watched from the comfort of his warm bed. When it got up and walked, it became clear this guy is the Crooked Tail Kitty! I haven't seen him in quite a few months. The last I heard from the feral caretaker a few blocks down the street, CTK was hanging out at her place. Hello Oliver, mind if I take the bottom bunk? I wish Oliver was this welcoming of the Brown Kitty! 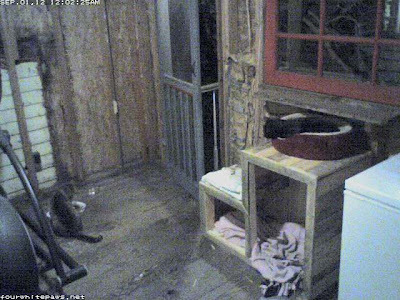 Seeing the Crooked Tail Kitty come for a late snack throws a monkey wrench in my raccoon-proofing plan. CTK is old and not overly stable on his legs, I imagine his jumping days are over. So, if he's not able to jump into he raccoon-proof feeder he may not get food. I believe in an "every cat is welcome for a meal and safe, dry place to sleep" policy, so I'll need to figure out another way to have food down that CTK can access but not the pesky raccoons. I know I'm too busy when poor Mr. Oliver doesn't get his morning loves time. This morning is the first time in four days he got to come inside and get some morning loves on the bed. One of those four days, I went looking for him and he wasn't around. He's always around in the mornings, so I grew very concerned. When I got home from work that afternoon, I walked around the block looking to find him laying out in the road. But thankfully, no luck. I went back home and opened the garage to fill the feral feeder and low and behold there he was! He had spent the night and day locked in the garage! So glad he's ok! I was at a training class all day yesterday (and will be there again today - ugh!) Laura was home at the cats' dinner time. Usually the campaigning starts hours early and lasts up until 6pm, when they eat. On this night 6pm came and went with no signs of hungry cats. Very odd. Laura decided something was up, so she went looking for evidence. Sure enough, they had somehow gotten into Buddy's nugget stash we keep upstairs under the sink in the bathroom! All of the cats had so gorged themselves they wanted nothing to do with dinner. That was a first for Theo, seeing him sniff kibble and not eat it. Even this morning, most of the cats have shown little interest in breakfast and they have been laying around with fully bellies. They must have really gone crazy with the unlimited nuggets! Not much new news on my mom's health. She has undergone two tests to determine if cancer is present in the nodules in her lungs. One test came back indicating no cancer and the other came back indicating cancer. So now she awaits a third test that will be more definitive. Prayers and purrs are still appreciated. We're sending purrs and prayers for your Mom. 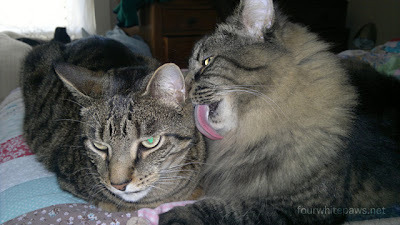 Recently, during dinner time, Cosmo and Ling turned up as usual, but when presented with their food, they took one bite and left. This was unusual so I went to investigate. When I got upstairs, I knew why. Cosmo (most likely) had torn into a bag of food (a neighbor had given me to feed his cat while he was away) and the both of them gorged themselves silly! Good thoughts to your Mum. We are also glad that you found oliver! The TNR must be very rewarding! Wow. Thank you again. I know I have said that but Oh, I do so thank you for helping with the TNRing and for helping Oliver and his family and other kitties needing assistance. You and your wife are heroes to me. Sounds like you are going to have a nice little party there. Wish I could come. Purrayers fur your Mom. We are so glad the kittehz have you in their corner! Your work is awesome and inspiring. Happy Sunday. Sending prayers for your Mom...we read your TNR post yesterday and were amazed! Purrs, prayers, and hugs for you and your mom. The big C is scary and we hope the third test will come back negative (no cancer)!